Description: Lovely well maintained 5br 4ba home located in the quiet subdivision of natures trace. New trane 5 ton hvac system installed 5/2013. New roof installed 10/15. New hot water heater installed 2014 new 4 board fence installed 2011. Custom cherry kitchen cabinets. Hardwood throughout with ceramic tile in the bathrooms. Upgraded fluted trim and crown molding throughout. Tray ceilings in 4 rooms. Large formal dining room. Wood burning fireplaces on each floor. Additional 1100 sq feet of unfinished storage in basement. 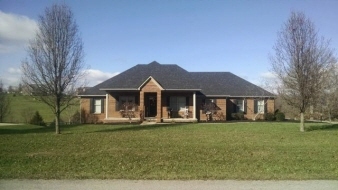 Great neighborhood only 20 minutes to nicholasville road and man-o-war. Data believed correct but not guaranteed. Buyer to verify data prior to offer. Agents read agents remarks.